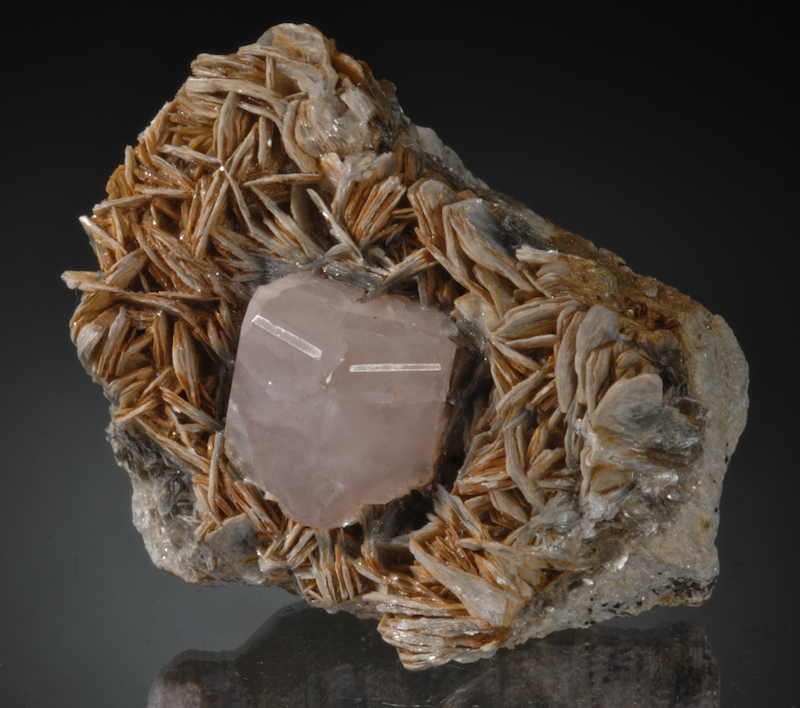 A prism of pink Apatite (Fluorapatite or Apatite-CaF)is nestled in a Muscovite matrix. 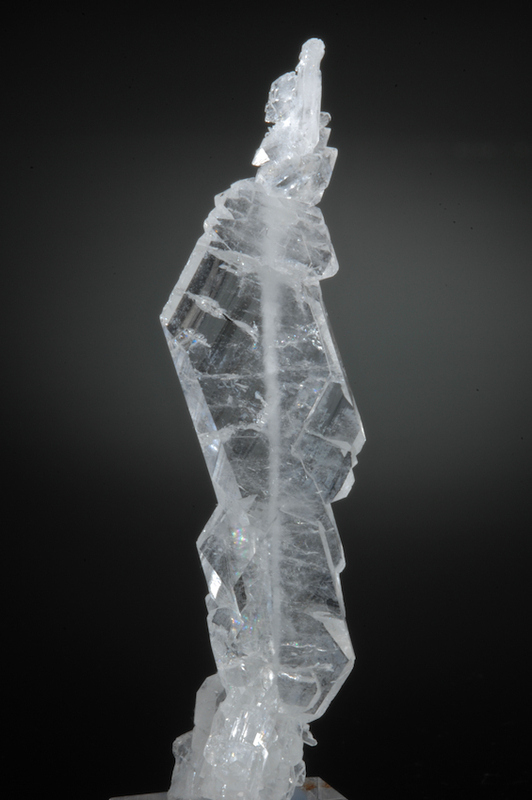 The crystal is 2.1 CM across and has distinctive modifications of the edges of the termination. 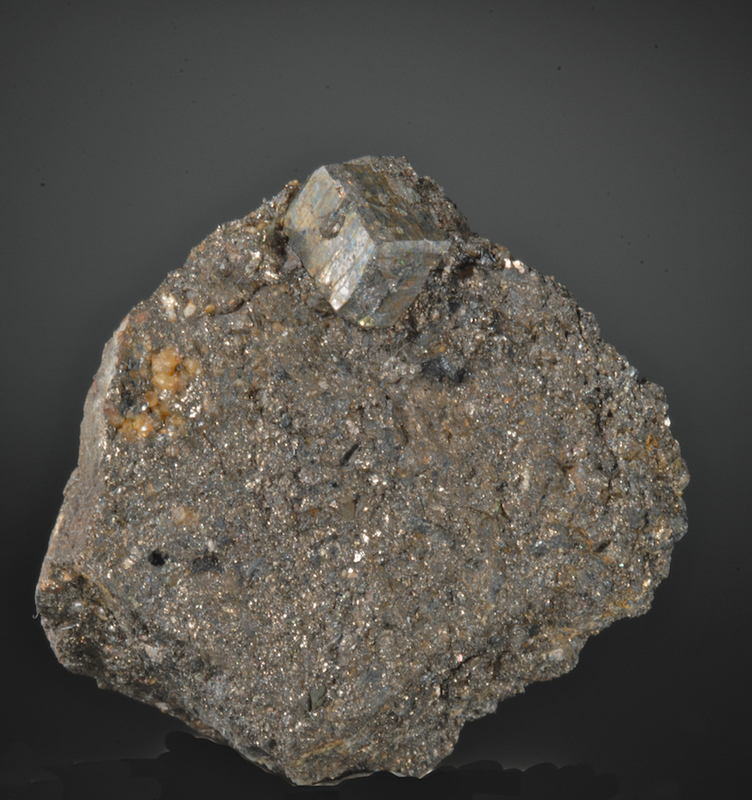 From the earlier finds of Apatite at Chumar Bakhoor, this is in excellent condition. Esthetic contrast with the matrix, the Apatite looks fine from all angles. 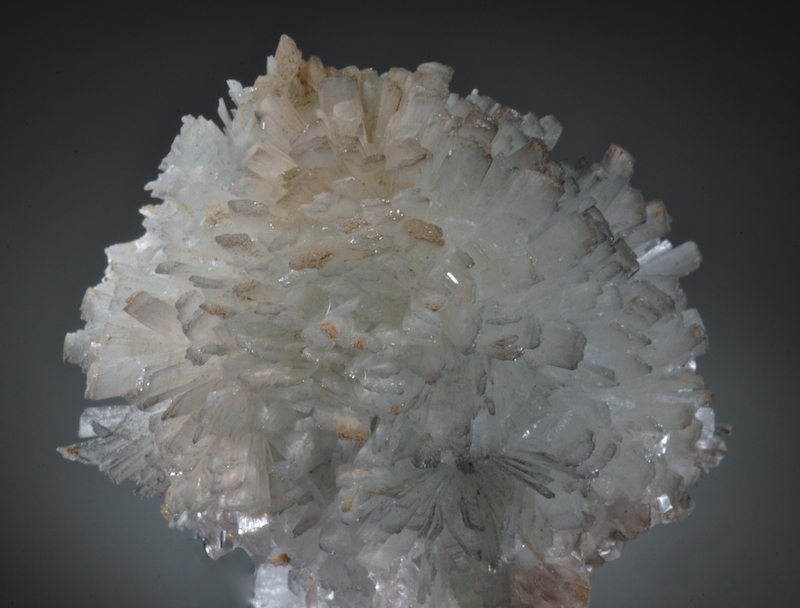 A starburst of glassy Hemimorphite crystals with the extra attraction of being a nice pale blue color. From 2015 finds in Mina Ojuela, this is an especially fine and esthetic specimen. 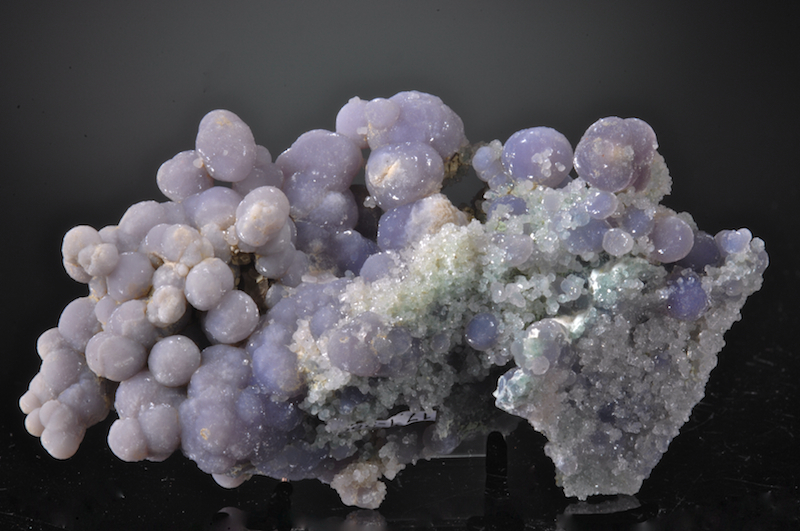 Some of the best Hemimorphite ever found comes from this locale, but very little ever had this most desirable blue color. The individual prisms are up to 1.1 CM long and have a bright glassy luster. Choice and very rarely available in this quality. 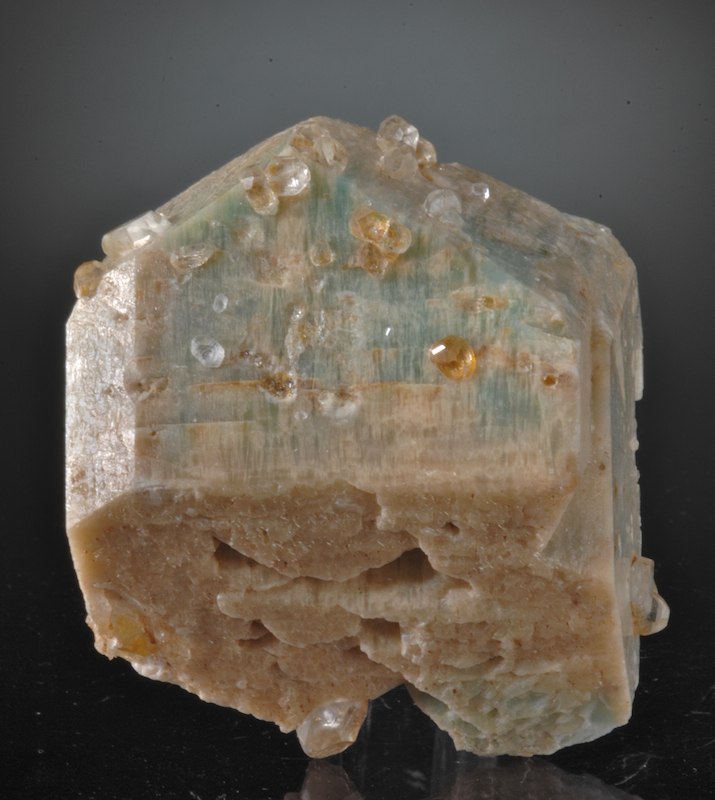 A big, blocky Microcline (Amazonite) crystal with several faces sprinkled with clear Topaz Crystals. 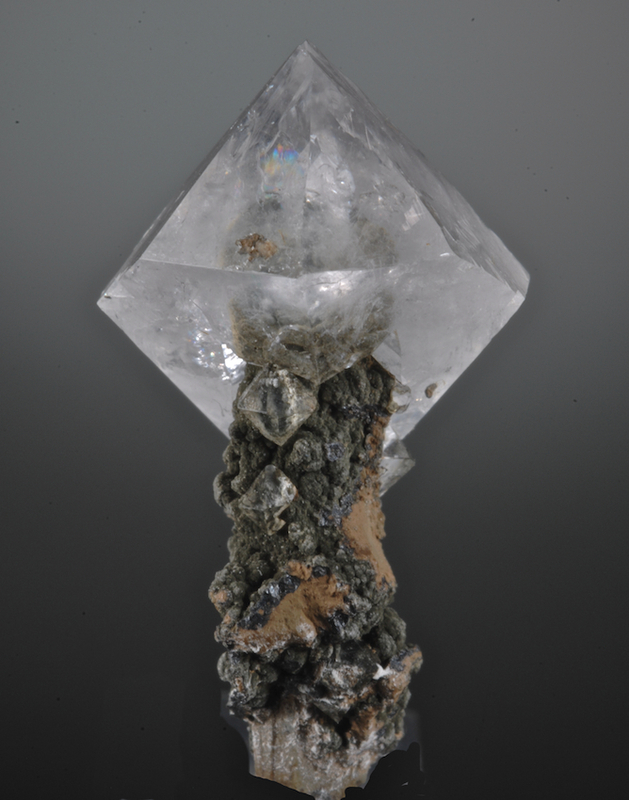 A fine Erongo specimen that comes from the hard labors of the small miners on Hohenstien. The Topaz are up to 8MM in sizesharp, gemmy and most are colorless. The back of the specimen is contacted but the front and sides are in excellent undamaged condition and displays well. The green color of the Amazonite is not very often seen from this area, it makes a fine setting for the clusters of Topaz. The Pure Potential (or North Geronimo) mine has become famed for outstanding Vanadinites, some of the best ever found in the Americas. Top pieces have an intense red color that is distinctive. This piece has that color and crystal sizes are above average for the hexagonal non hoppered type. Well isolated on a contrasting dark matrix the specimen has fine luster and flash. Several of the Vanadinites have some Calcite prisms sprinkled on them best seen with magnification. Nearly perfect only one small zone has some micro damage, the rest of the hundreds of sharp crystals are impressively perfect. 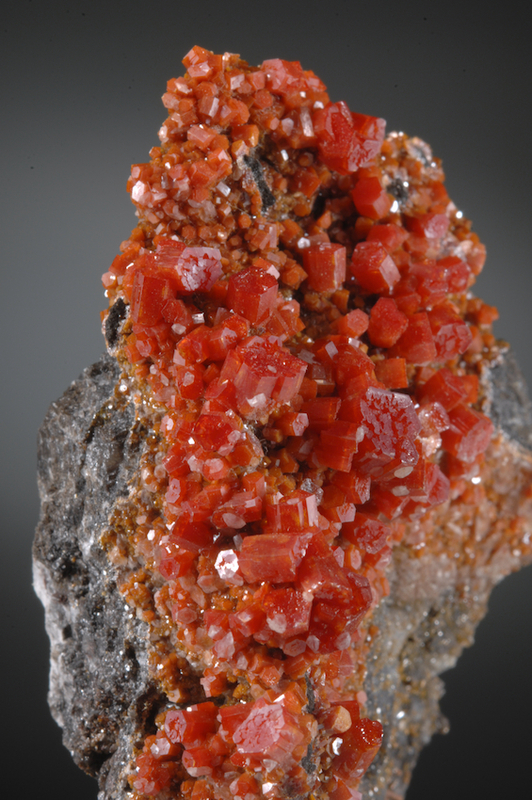 The mine closed back to the late 1800s but in the past few decades has been worked for specimens with occasional finds of fine pieces like this. A USA classic and a pretty specimen from anyplace. A very fine example from the 2014-1515 find in Waziristan that produced many good to superb Fadens. In perfect undamaged condition, this shows the internal white thread perfectly and the flattened prisms in a chain are lustrous and super clear. Far better in person. Much like a modern sculpture this is the habit that was the most desirable when the find was made, and this specimen is far above average. Now recognized as a world class discovery the source seems to be exhausted and fine pieces like this are getting scarce.